A tutorial on how to maintain and assign baseline for Primavera P6 has been published on last week. After a baseline is saved, you should be able to see baseline bar against current project bars if your activity layout setting is right. 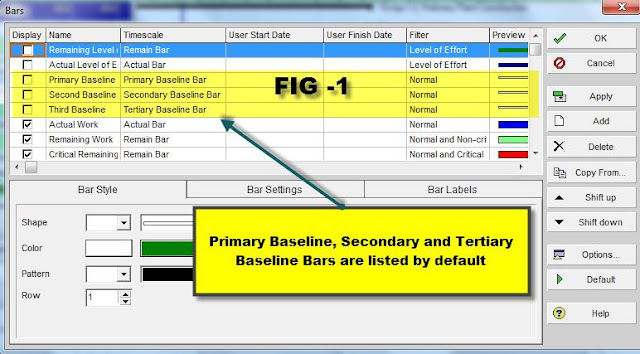 This tutorial covers how to show primary baseline bar, project baseline bar against the current project status bar as well as progress line. 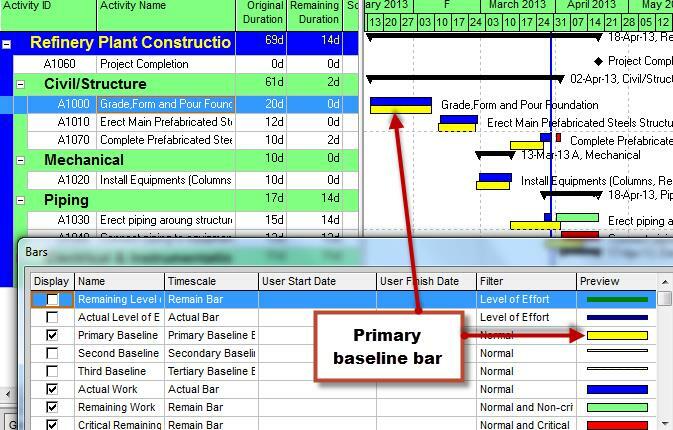 Project team member can view project performance very quickly and easily against the original baseline by reviewing graphical Gantt chart that shows baseline and current project bars. 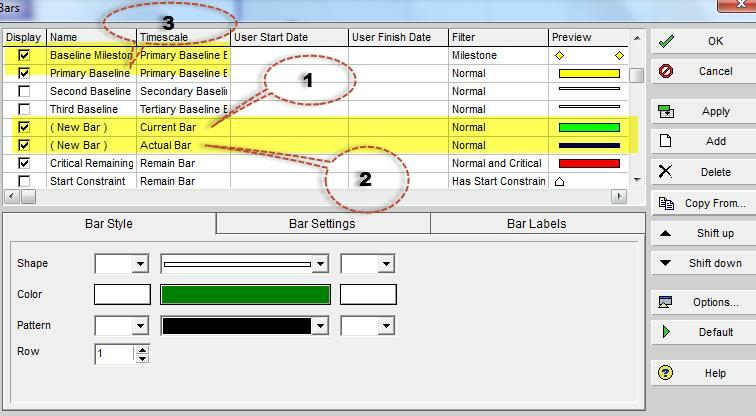 In case you are facing difficulty in showing baseline bar, then follow the following steps. First of all, open a project, and then open the default layout named “Classic WBS layout”. 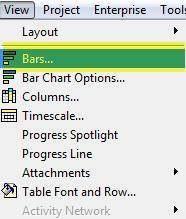 Check which baseline bar is selected in “Bar” dialogue window. So far, primary, secondary and tertiary baseline bar are listed in the default “Classic WBS Layout”. None of these bars are selected baseline bar. See Fig-1 below. 1. Select “Primary Baseline” Bar if you want to display primary baseline (user baseline) bar in Gantt chart. 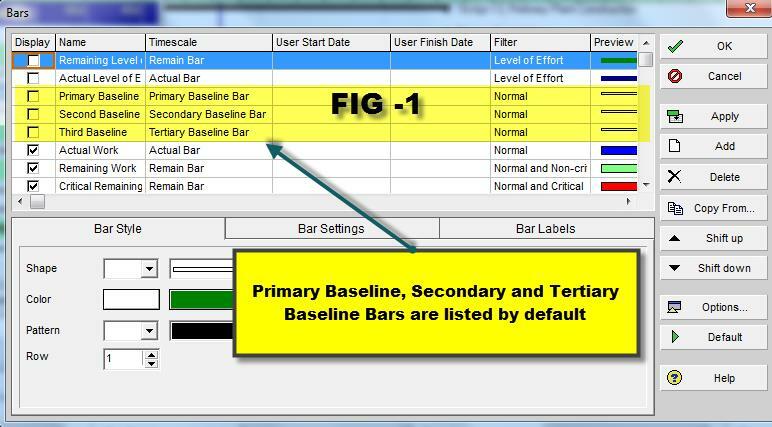 Primary baseline must be assigned in order to show that primary bar. See below and Fig-2. 2. Change the desired color for baseline so as to compare against the current project. 3. Set the bar position to Row 2 if current project bars (i.e. “Remaining Bar”, “Actual Bar”) are position on row 1. This would make baseline bar visible. 4. Finally, you can compare current project status against the primary baseline. See below. How to Show Project Baseline Bar? 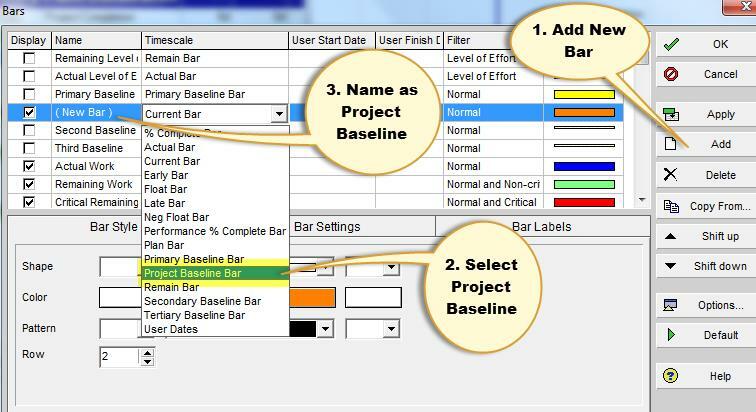 (1) Project baseline bar is not in your layouts thought project baseline has been assigned to your project. 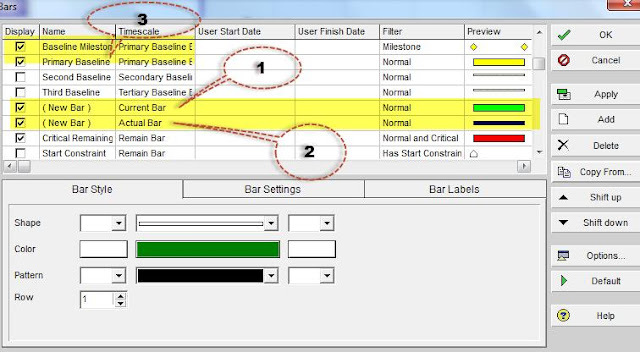 (2) Project baseline has not been assigned thought that particular bar is added to user layout. 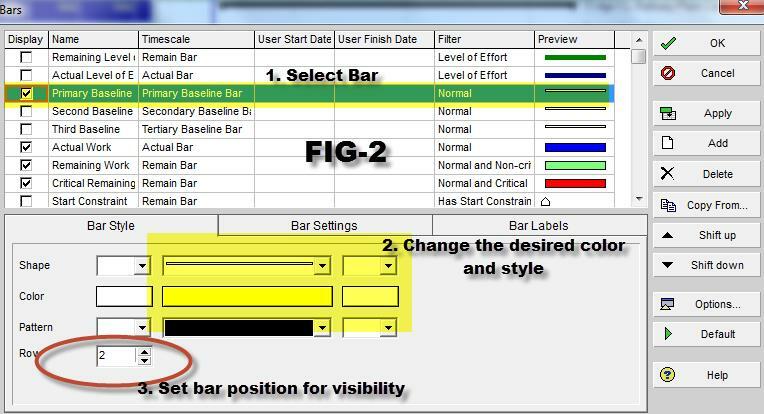 (b) Add and select project baseline bar, See Fig below. 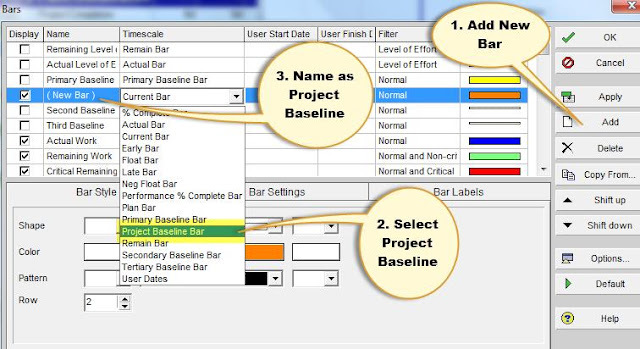 (2) Select Project Baseline Bar from “Timescale” drop down list. (4) Set the bar position (for instance, Row 2). How to Get Project Baseline Milestone Bar? Select the default Baseline Milestone. Primary baseline bar is used to show the baseline. See below fig. As discussed before, you won’t be able to see project baseline milestones if project baseline is not in your project. You can also show current project status against the baseline in different ways…..
1) Add “Current Bar”. Design bar style and row. Name as “Current Work”. 2) Add “Actual Bar”. You may also add “% Complete bar” instead of “Actual bar”. To show the progress bar within the current work, set the bar position to row 1 and choose the bar style to display inside the current work (i.e. Set the bar format to narrow bar and middle position). Try to play with the bar style until you get it. 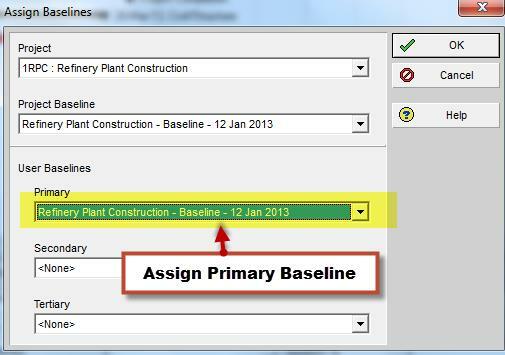 3) Select the “Milestone Baseline” and Primary baseline bar to show against the current project status. Current Bar Timescale and set to all activity filter to Current work bar. See picture below. 4.Finally you will get a layout that displayed baseline bars against the current project status. 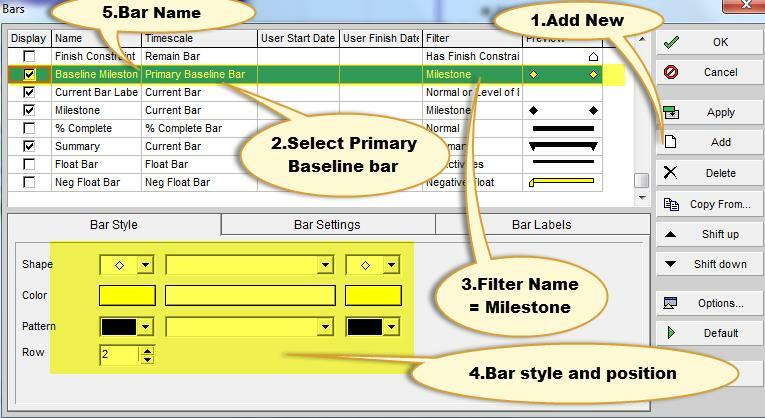 For your easy reference, simply download the sample layout that show baseline bar, progress bar and current project bar in a single Gantt chart. Then, import it back to your project to see this layout. If you are interested to learn more about how to play with activity layout and bar, I suggest you to visit "Beginners' Tips for Customizing Activity Layout in P6"
It is the same as MS project and P3. 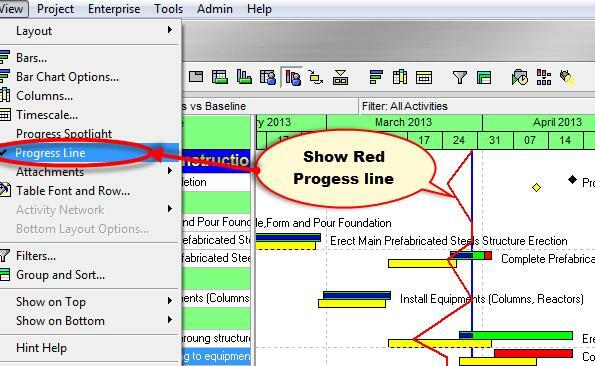 By displaying progress line to the Gantt chart, current progress status can be reviewed against the baseline quickly without looking at the details. (2) Select Progress line. Then you will be able to see red progress line against the baseline. See below Fig. 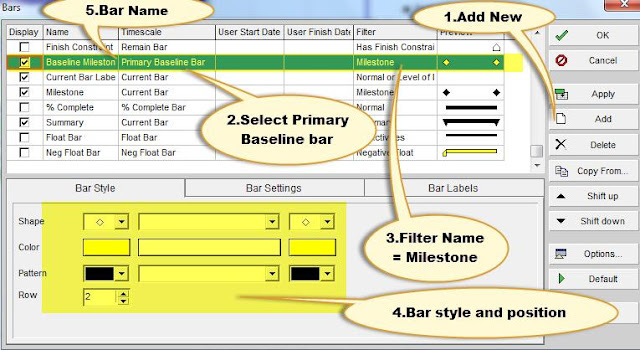 You may change the progress bar appearance by customizing bar chart option. See the snapshot below. - Select “Primary Baseline” if you want to show progress line against the primary baseline. Otherwise, choose “Project Baseline”. - Select “Based on difference between current and baseline activity’s” to display progress line based on the different dates between current and baseline activities. 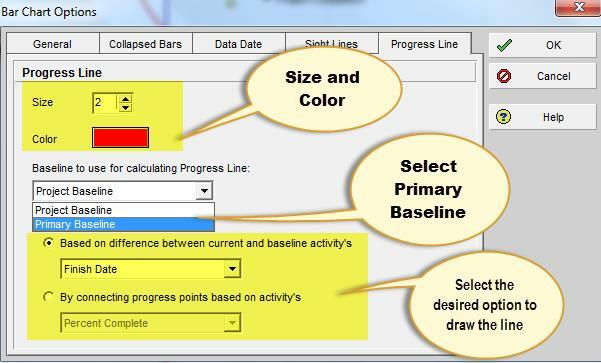 - Select “By connecting progress points base based on activity's” to display progress lined based on the activity % complete or remaining duration. I hope this tutorial would definitely help when you prepare layouts for showing baseline bars, progress line vs current project status. Really nice work. Thanks for sharing with us.